Most people probably don’t think of hard liquor when they think of France. But nowadays it’s hard to pass one of the many cafés in Paris which features les happy hours and not see a round of mojitos on just about every table. From the looks of things, they’ve become more popular than wine or beer. 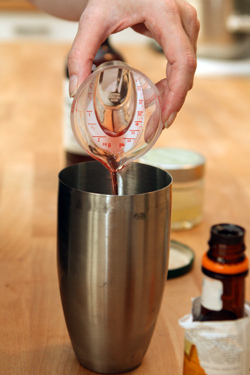 Unfortunately most are not very well made and as cocktail fans know – and even those of us that only occasionally imbibe – that there’s a definite art to making mixed drinks. And it’s curious that many of the world’s great spirits, such as Lillet and Noilly Pratt vermouth, are French. 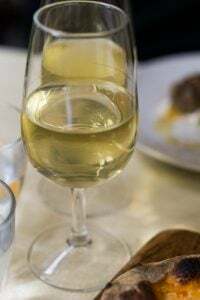 Yet few people in Paris know what they are and I recounted the mix-up that happened when I ordered a Lillet at a café in Paris in TSLIP. On the other end of the cocktail spectrum in Paris are places like the Hemingway Bar at The Ritz, famous for its Martini (as well as its hefty price!) and the myriad of excellent cocktail places that have sprung up in the last few years. 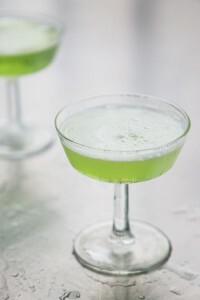 Although my days of being able to drink four or five martinis and still be able the function the following day are in my past, with all the talk about the terrific cocktails being poured around Paris, I’ve been finding myself craving cocktails like I used to, albeit in more prudent quantities. Talking about the success of the cocktail scene in Paris, she noted with amusement that a couple of fellows opened a New York-style cocktail bar here, which was a hit. So now they’ve opened the same type of “Parisian” cocktail bar back in New York, making a full circle. It was so much fun I invited her back to share a drink called the Scofflaw, one that’s not necessarily something you would find in a cocktail bar in Paris. But it’s rooted in Parisian culture and has a transatlantic story behind it. The Scofflaw was invented at Harry’s Bar in Paris during prohibition to taunt those back in the states who couldn’t drink (or were considered criminals if they did), hence the name: if you were drinking one in Paris during that time, you were considered a scofflaw. Back then, Canadian whisky was used because there was none coming out of America. 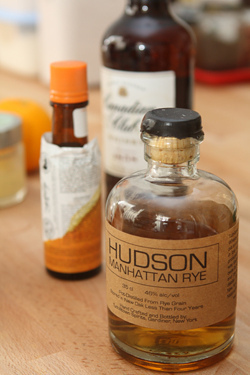 However nowadays there’s no shortage of liquor in America, or in France, and Forest brought over a bottle of Hudson Manhattan rye (which has become one of my new favorite things), which she explained must be made with at least 51% rye, because she wanted me to taste the difference, along with a bottle of Canadian Club. She also brought a jar of scarlet-red homemade grenadine, a syrup traditionally made from pomegranate juice, although she said nowadays most brands are just sugar syrup with food coloring in them. And with pomegranate juice widely available, she mixes her own: one part pomegranate juice with one part sugar. (If you want to keep it a while, she says to pour in a little bit of vodka.) She also adds a few drops of rosewater to highlight the flavor. I had two Scofflaws and felt a lot better after I tasted them. (Thanks, Forest!) Both were good, although the one with Hudson Manhattan rye whisky, which had a more notable spicy, peat-like taste, is the one that I preferred. Although one could use another whisky, which isn’t a crime. Recipe by Forest Collins of 52 MartinisForest noted that some recipes for Scofflows finish with a twist of orange, some use lemon. The orange bitters are nice in here, but in case some people don’t want to spring for a bottle of orange bitters, you can leave them out, although Forest likes to use them. Orange bitters are very good in martinis, in case you do decide to pick up a bottle. Add ingredients to a cocktailshaker full of ice. Mojitos! You know, there are more than a few bars in New York where they refuse to make mojitos–too time-consuming. The Parisian bartenders will probably soon grow frustrated with them. Where do you find your beautiful absinthe glasses? All American Made Rye must be at least 51% Rye to be labelled Rye Whiskey, Canadian Club is also Rye, so I’m confused why you said you preferred the one made with Rye. Kirsten: The ones in Parisian cafés aren’t made by seasoned bartenders, but generally by café counterpeople, who aren’t really cocktail enthusiasts. And since they’re so popular, prodded on my a certain affinity for Cuban things, I suspect we’ll be seeing them for a while longer. Mike: I’m not an expert on cocktails or liquors, which is why I rely on Forest – but according to the Canadian Club’s website, it’s not called a rye whisky (at least the one she brought over) but is made with rye along with corn and barley. I haven’t found anything that said the actual percentage of rye in it. There’s always a bottle of Noilly Prat beside my range and more often than not I reach for it instead of white wine when cooking. Your cocktail glasses are quite handsome. 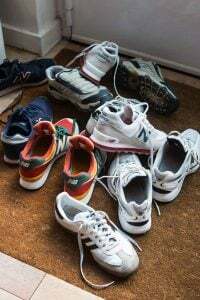 Pardon my rudeness – who makes them? I have a decided weakness for glassware that’s never sated. There are a few types of vermouth. White (dry), red (sweet), and then Noilly makes something in between (amber). Thanks, David for a fun afternoon – always a pleasure to clink a glass with you! Mike: While Canadian Whisky generally has more rye in it, it doesn’t have the same percentage as American Rye. CC has a lot of rye in it, so it’s a good substitute, but it’s still not considered a rye. But, good point, because I think it’s one that’s not always immediately clear. Just moved to London from California and oh how I miss cocktails! The booze is so expensive in England. Next time I go home my suitcase is going to be crammed full of bourbon and Mexican hot sauce for the trip home. 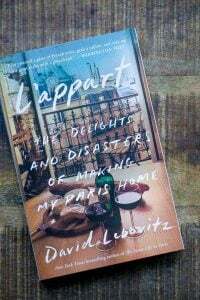 When I was in Paris, we visited a very good bar somewhere in the 11th district, near Rue Oberkampf. I drank a cocktail that was the mixer’s own creation, it was very good. We also tried the famous Calvados, which was very good, but very strong. I love cocktails with Forest, especially when she’s making them!! Interesting point about the Grenadine. Question, where does one buy all the different types of bitters? There’s a very good store calle La Maison du Whisky (6, Carrefour de l’Odeon) that has a good selection of bitters. There is also a place called Sipeasy that Forest likes as well. She writes a little bit more about them both on 52 Martinis. Um where can you buy Canadian Club in Paris?? I generally dont like any whiskies etc but I do love Canadian Club and I can’t seem to find it anywhere in Paris!! I have been very into trying new cocktails lately. I appreciated this article David. Thanks and I hope there will be more ! Nooooooooo! Have the French really started serving spirits in jam jars? When I saw it in the US, I thought it was a stupid idea unless you were swigging moonshine while canoeing deep in the woods of Appalachia and you didn’t want to offend your redneck hosts. Using them regularly in an urban environment is just such a pose and ruins a good drink. However, I would add that it is not nearly as stupid as serving cocktails with liquid nitrogen in them. transporting to David’s place, not drinking. I never knew that Harry’s Bar in Paris is not connected in any way to Harry’s in Venice. That sounds rather nice. I was recently on a cruise in the Black Sea (go me! But it was a present! ), and we ended up drinking cocktails most evenings. I discovered I like Manhattans and Old Fashioneds…. will have to invest in a bottle of Angostura, I think! great Martini in the City of Light even when my heart tells me to drink Bordeaux! 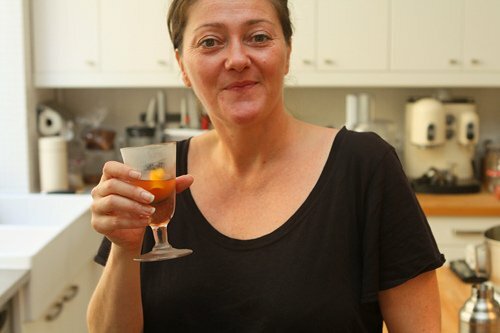 Thanks for sharing the recipe for a little known French cocktail! I will be back in January, ready for my annual Tweetup with Forest and friends where we will definitely have a sip or two. Join us!!! The link to the grenadine recipe that Forest so graciously provided calls for “unbleached sugar”. Is turbinado sugar a good choice? I know it’s usually known as “raw” or “cane” sugar. Or should I look for unbleached “white” sugar? As someone said above, I adore your absinthe glasses! It’s 8:10 am here in Austin and I’m craving this ice cold cocktail! Bad, bad man! David, Try adding Lemi Shine to your dishwashing detergent to remove and prevent the film on your glasses. I discovered it a few years ago and it works great. Also the appliance store said to use a cheap generic dishwashing soap since it does not have the additives of the more expensive name brands. And to use only 3T soap plus 1T Lemi Shine(final rinse box). Thanks, but I don’t think Lemi Shine is available in France. Unfortunately many folks have recommended solutions, but it seems to be a consensus that once glasses get calcified, it gets ‘baked’ into them, and nothing takes it out. People in France put salt in their dishwasher or white vinegar, (or Calgon, although that’s supposed to be bad for the environmen) to avoid it. But it doesn’t work 100% so I just wash vintage glasses by hand. I hope this new interest means you’ll be attending next year’s Tales of the Cocktail conference in New Orleans (as I only get to France by reading your blog). Also, I did not realize grenadine was so easy to make. As usual, a good read – thanks. In the recipe for grenadine so graciously provided by Forest, it calls for “unbleached” sugar. Could turbinado sugar be substituted? I know it’s generally thought of as “raw” or “cane” sugar. Or do I need to have actual white “unbleached” sugar? I love the absinthe glasses as well. And thanks for making me want this ice cold cocktail at 9:22 in the morning in Austin! I’m trying to revive older liqueurs and fortified wines such as Martini Rosso, Noilly Prat and Cinzano Bianco. I think they have old timer-cool. I love St Germain Liqueur- Elderflower based either on it’s own or on the rocks or turned into a granita with added edlerflower or elderberries; the latter makes a gorgeous Autumnal drink. I love that St Germain liqueur, too. It’s wonderful. 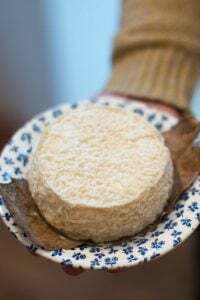 Noilly Prat is an essential ingredient of my pickerel en papillotte recipe, but it’s not available here in New Brunswick so I have to bring it back from Quebec. There is no substitute and I also prefer it for martinis. In the old days, manhattans were also a favourite of mine, and like you, gone are the days when I could down four cocktails and still function the next day… or the day after, for that matter! Just spent 3 weeks in Paris visiting my French friends. Since I’m from Los Angeles, I thought I’d prepare a ‘omemade Mexican dinner complete with Margaritas using my 3-2-1 recipe: 3 parts Silver Tequila, 2 parts Citronge (that I brought from the States), and 1 part fresh squeezed lime juice. Thankfully my friend had an American refrigerator with an ice machine so I could shake it up in a cocktail shaker with lots of ice. Well, they loved it and a few days later, when we got together again for Apero, they asked me to “make that Devil Juice again for us”! So which type of Noilly Prat do you prefer in the Scofflaw – red, white, amber? Forest used the Noilly Prat “original dry” which is the white one. I thought the glasses were frosted / chilled in the freezer, not filmy. . .
A fantastic cocktail that I had nearly forgotten about- I know what I’m having tonight! Thanks David and Forest! Interesting article – and educational too! now I know the background behind the drink! looking forward to making one myself or I’ll just wait and get Forest to make me one herself when I’m next in Paris! 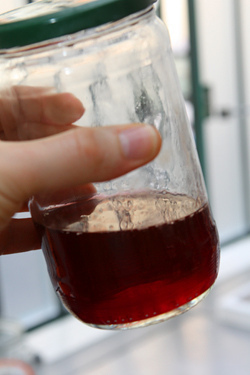 and I agree that making your own grenadine syrup is so much better than anything you can buy in the shops – and its quick and easy. Barolo infused with quinine bark, grand wormwood, rhubarb, root ginger, gentian and aromatic spices. We like it because 16.5% alcohol (less than spirits) and very flavorful. You may enjoy it with soda over ice. Such a great color to that cocktail. I’m not a huge drinker, but I do like a well-crafted cocktail every now and again. I had no idea that grenadine is usually just simple syrup and food coloring now; pretty disappointing to hear. Ooooh. I love manhattans! That is my family’s up-town drink. Starting way back with my parents and carried thru with my kids. They are dynamite, tho. Fascinating about the grenadine recipe. But, I am shocked by you saying that Forest uses dry white vermouth. I don’t think I have ever had a Manhattan with anything but sweet red vermouth. Is this a new thing? Is it even legal??? They taste so different, the 2 vermouths. I would also like to know more about Forest. Who is this woman? Does she live in Paris? Is she connected with a particular restaurant or bar? Does she have a recipe book for drinks? Very interesting article. Thanks. @nic miller: If you’re interested in the revival of old liqueurs, cocktail ingredients, etc, you should take a look at what Tempus Fugit spirits are doing – they’ve just come out with a new Kina and are recreating and reviving some old recipes. @jeremy: Yes, there is Noilly Prat amber – which for quite some time was surprisingly difficult to find in Paris and I was having to special order it. Now, it’s a bit easier to come by. Kathy: We were using the dry vermouth for the Scofflaws – not for a Manhattan – never! :) sweet vermouth for that! I read the Ritz is closed (mon dieu!) for a two-year renovation. Is the Hemingway Bar still accessible? From rue Cambon, perhaps? Rye whiskey is becoming popular in N. America after a long recess. Bulleit Bros. make it in Indiana at a very reasonable price, Michter’s makes a more expensive Rye whiskey that is delicious. 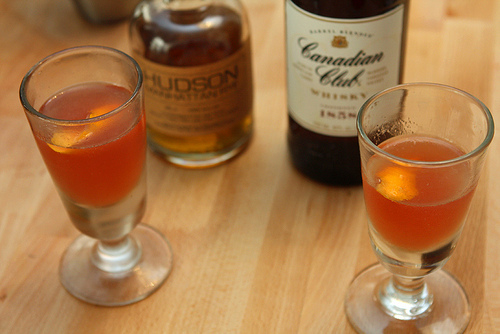 Both are great in Manhattans and their many variations. The recipe in this article looks great. I make a cocktail at home that includes these ingredients but also adds 1/2 oz simple syrup and a scant 1/2 teaspoon of hot pepper relish (mostly chili flakes), which strain out. 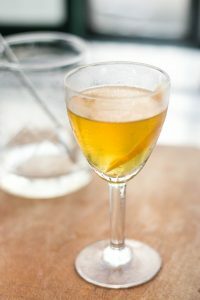 When available, I first muddle some basil leaves and fresh curry leaves, add the chili relish, simple syrup, lemon juice, grenadine and Rye (you can mix Rye with Bourbon to round the flavor – there is a French whiskey called Bastille that mixes well with Rye). 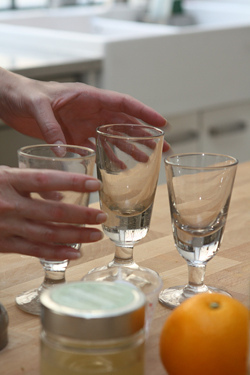 Add ice, shake it, strain it, serve it with lemon peel, basil top leaves, sliced orange or a brandied cherry. You can use Fee’s to foam it if you like. A spicy Manhattan! Deux a deux: Sadly that is true. They are saying they will be back in a couple of years. But, on the up side, there are lots of good places now to get good cocktails – and even ones that don’t command Ritz prices. And for the Shirley Temples, no, the vodka trick probably won’t work. But fortunately, it’s easy enough to make that you don’t have to do it in really large batches. Hey David you should go check out the Experimental Cocktail Club on 37 Rue Saint-Sauveur! It’s one of my favorits in Paris, a bit hard to find but if you look hard enough you’ll see it. Enjoy! Concerning Lemi Shine…everyone told me that my glasses were permanently ruined and the film was “baked” on by the dishwasher, but the Lemi Shine removed it on all of my affected glasses. Lemi Shine is also for sale on Amazon. Forest, thank you for your thoughts on turbinado vs. regular white sugar. A girl’s weekend in Austin? How wonderful! Is it the weekend of Nov. 16-18? Formula 1 is in town that weekend and the entire city is supposed to be overrun with fans. We already have our tickets. I have three suggestions for great classic cocktails in Austin, in no particular order. FINO Restuarant Patio and Bar at 2905 San Gabriel (512-474-2908), Peche at 208 W. 4th (512-495-9669), and East Side Showroom 1100 E. 6th (512-467-4280). Thanks for your help and I hope you enjoy Austin! oh the french and their culinary rules, you have to love them. Great post. 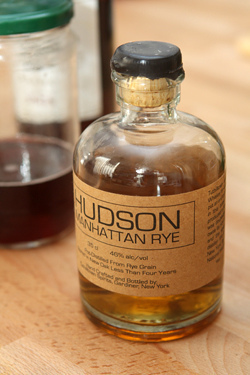 Did you know that Hudson makes a 100% corn whiskey? 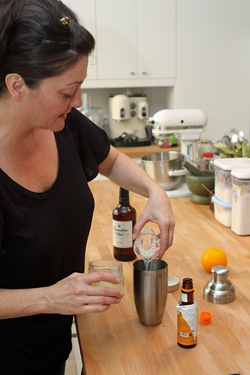 This is essential for those who are gluten-free and would like to make a cocktail using whiskey. 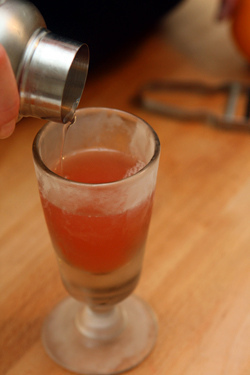 Last summer I copied a cocktail created by a bar in NY – whiskey, lemonade, fresh watermelon juice (can’t remember what the garnish was; maybe mint or basil) – with the Hudson corn whiskey and it was quite good. Not as good as it would have been with their other whiskey, but pretty good for a GF person. Love Forest’s blog 52 Martinis!! I made the mistake of ordering a mojito at a bar in Paris. The bartender put bitters in it. I drank wine the rest of the trip. How did you get Hudson??? It’s made in upstate NY and is so difficult to get here in the Northeast! Their Hudson Baby Bourbon is amazing too. Reason no. 5,321 to visit Paris! ps going to check out Forest’s blog and ECC in NY. Thanks!!!!! You can find it here, but it’s quite expensive. I think Forest said it’s a little over €50/bottle. Cocktails are the thing here in San Francisco too but OLD ones. Last year, my friend Matt ordered a sidecar–so ahead of the curve–and the bartender didn’t know how to mix one. This year: no problem. And rob toys, manhattans, definitely whiskey based cocktails. After a long goody-goody abstemious period I was reintroduced to cocktails this year in Las Vegas (an excellent place for it). Woohoo! I remember reading about grenadine in ny Frech textbook and thinking it sounded delicious, so it’s disappointing it’s been so debased. Sounds easy to make your own though. And it would be worth it to make that gloriously-coloured Scofflaw. I have to say that I avoid cocktails, now. In fact, I avoid to “mix” alcohol, when we go somewhere. I just drink wine. awww. Love this post ‘cos there’s so much Forest in it. She’s the best, isn’t she ? When I was at the store today, I saw a bottle of grenadine syrup and picked it up to see what was truly in it. Sugar was the number one ingredient, and way down the list was fruit juice – just 10%. And the main fruit was ‘strawberry’ – there was no pomegranate in it (which is odd because a pomegranate in French is grenade). So I’m going to try making it myself, too. Like Forest! Amy: For the Hudson, I got it at La Maison du Whisky Fine Spirits (their branch at Odeon) – David already mentioned LMDW upstream in the comments & they do have a really large selection of things that are difficult to find elsewhere. Great article on the Scofflaw (one of the few whisky-based drinks I like especially when Forest make them!) and love the pictures! I didn’t realize how easy it was to make grenadine syrup. Will have to try that myself. Thanks for brightening up my day with this post! In the same proportion as recommended. It was awesome! The only tweaking needed was a 25% reduction of the too sweet commercial grenadine. My drink was also a lively hot pink! thank-you! MAC. I love finding a new cocktail of mysterious balance, where all the ingredients meld into something quite new. Can’t wait to make exactly as written. je suis tombée sur votre site tout à fait par hasard et je l’adore ! I am a huge admirer of your blog, especially your wonderful writing. 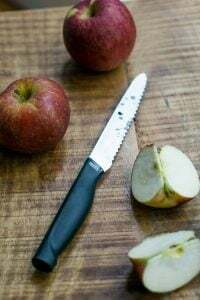 I have been wondering–have you ever had to create recipes/”edit” meals for persons who, for various medical reasons cannot consume certain foods? If so, have you written about this? Due to several complex medical conditions, I cannot consume either salt or sugar or hot spices. Sorry if this is a silly question, but I am quite intrigued on whether there are exciting recipes. 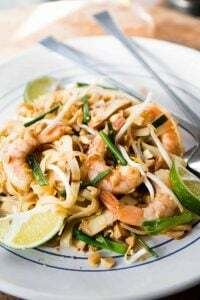 Most people who write recipes on special diets (such as gluten-free and so forth) know how to modify and “edit” recipes for their own needs. So often they are best-equipped to alter or create recipes that meet their particular needs. I really love your new kitchen. Looks like the kind of place you actually want to Be in, some of those big modern show-offy kitchens sort of push you out of the kitchen in a way, your welcomes you in. 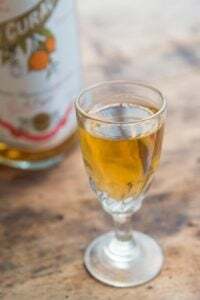 This post reminds me of an interesting and fun book called “Boozehound: On the Trail of the Rare, the Obscure, and the Overrated in Spirits ” by Jason Wilson. It explores the history of spirits and the origins of what we drink. 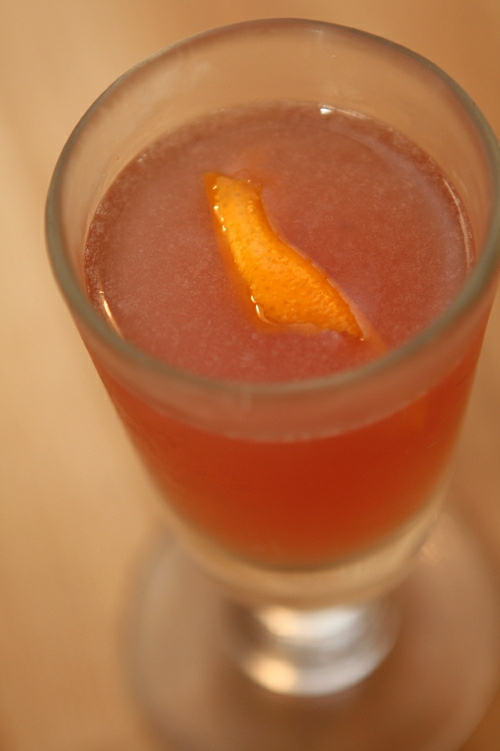 It also includes many recipes for old style cocktails, like the Scofflaw. You might enjoy reading it. It inspired me to try making my own “booze” this summer using fresh berries and vodka….turned out great, like summer in a glass. BTW love the images of your kitchen from a previous post…looks like it turned out well. I think it’s good to taste-test things side-by-side, especially when you are a novice (like I am, about rye). Forest brought both to show me how different the two could be. Especially in a mixed drink where folks often think that the liquor doesn’t make a difference because it’s being mixed. I’m always on the look out for classic French bar glasses/tumblers printed with drink logo’s. I have a set of six Orangina glasses and my Father who lived in Haute Vienne until his recent death gave me a set of Pastis glasses given to him by his local bar. Suggestions for other designs and where I might best find them would be welcome as they are hard to come by. Being British, I of course possess the classic Babycham glasses with cute deer logo. The drink? Not so good. 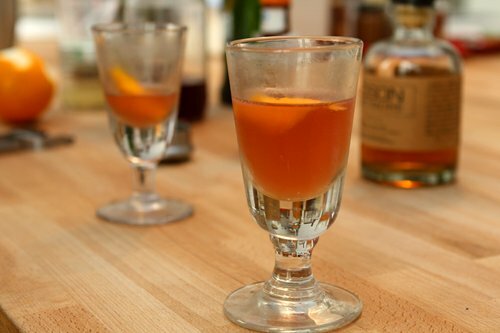 My current favourite cocktail as recommended by James Villas (bows head in worship) is the Sazerac. Place Herbsaint in a well-chilled Old Fashion glass. Tilt glass to coat sides completely and pour off excess Herbsaint. 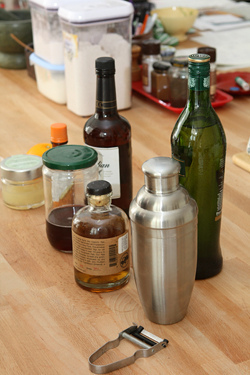 Place Rye and Peychaud bitters into cocktail shaker with ice cubes. Shake for 30 seconds and strain into prepared glass. Twist lemon peel over drink and drop in gently. I used to have Noilly Prat white on hand all the time for cooking & drinks, but the bottles sent to the US were changed to a new formulation specificly for the American palate. Think sweet! Now I only have Noilly in Europe. Brand managers & marketing people should never be allowed to have a say in formulating a product. This Noilly Prat change is to me like the Coca Cola fiasco. I wait for the original Noilly Prat to be available in the US. Hi David, great recupera, I’ll definetly try it. But the reason for my comment are the photos you posted…… Is that your renovated apartment kitchen? Since some months ago you posted about the renovation your new apartment was ‘suffering’, I’d love to see it finished……. I’m sure is great. I’ve been making this drink often since you posted it. LOVE IT! 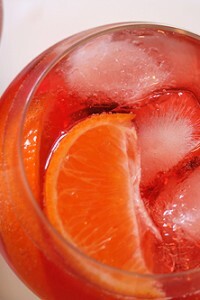 Although I’ll have to try making this homemade grenadine, since mine have been bright red instead orangey-brown. Being in Kentucky, we have a lovely assortment of ryes, bourbons, and whiskeys, so I’m having fun trying all the different variations. Thanks again, David.